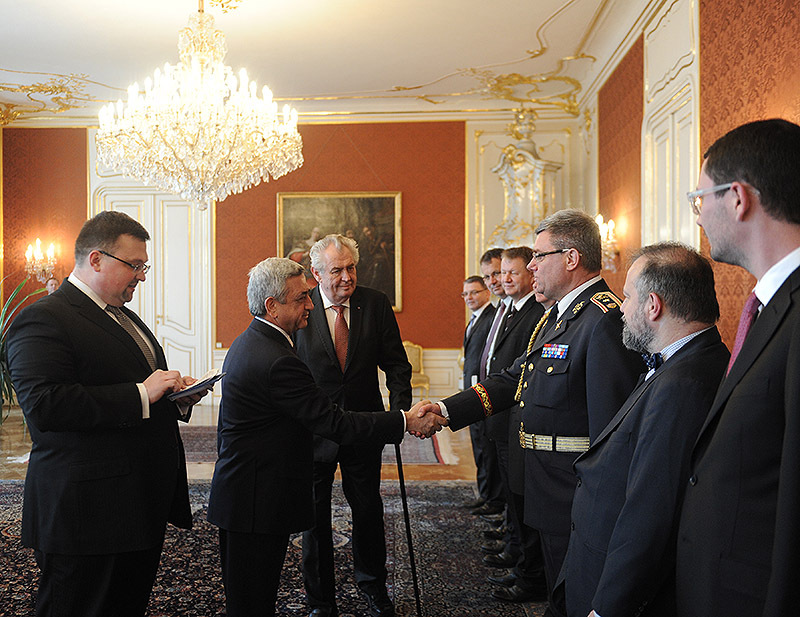 On January 30, President Serzh Sargsyan, who pays a state visit to the Czech Republic, held a meeting with President Miloš Zeman. At the end of the two Presidents’ negotiations, a signing ceremony of bilateral documents took place aimed at fostering and expanding cooperation in a number of areas. 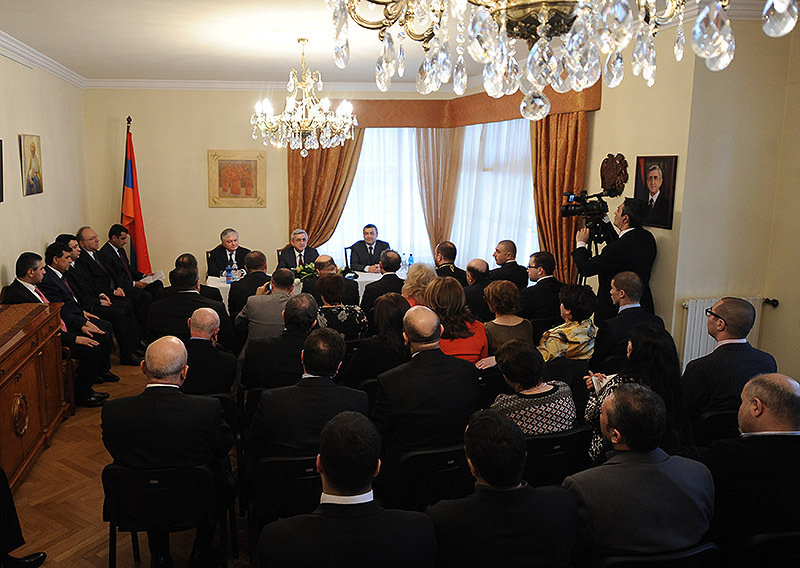 In particular, Agreements were signed on Cooperation in Fight Against Crime between the Government of the Republic of Armenian and the Government of the Czech Republic, On Economic and Industrial Cooperation between the Government of the Republic of Armenian and the Government of the Czech Republic, On Cooperation in Healthcare and Medical Science between the Ministry of Health of the Republic of Armenian and the Ministry of Health of the Czech Republic, Memorandum of Understanding on Disaster Prevention and Elimination of Consequences, Fire Service and Public Protection between the Ministry of Emergency Situations of the Republic of Armenia and the Ministry of Internal Affairs of the Czech Republic, Joint Declaration on Cooperation in the Area of Environment Protection between the Ministry of Nature Protection of the Republic of Armenia and the Ministry of Environment of the Czech Republic, Memorandum of Understanding on Cooperation between the State Revenue Committee under the Government of the Republic of Armenia and the Customs Service General Directorate of the Czech Republic. 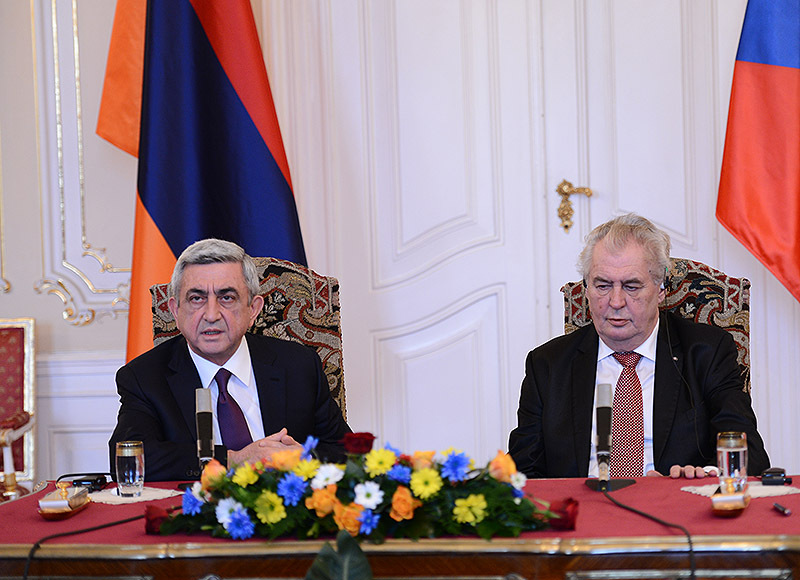 Presidents Serzh Sargsyan and Miloš Zeman summed up the results of their negotiations in a joint press conference. 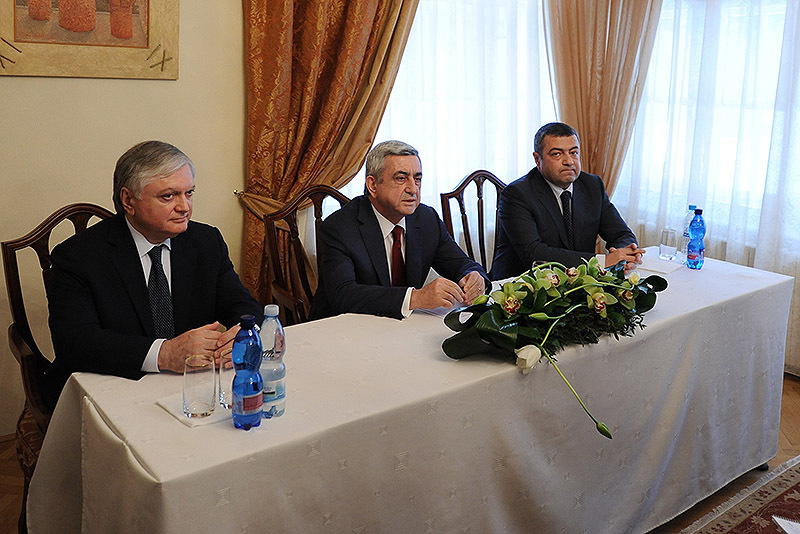 President Serzh Sargsyan held meeting with President of the Senate Milan Stech. 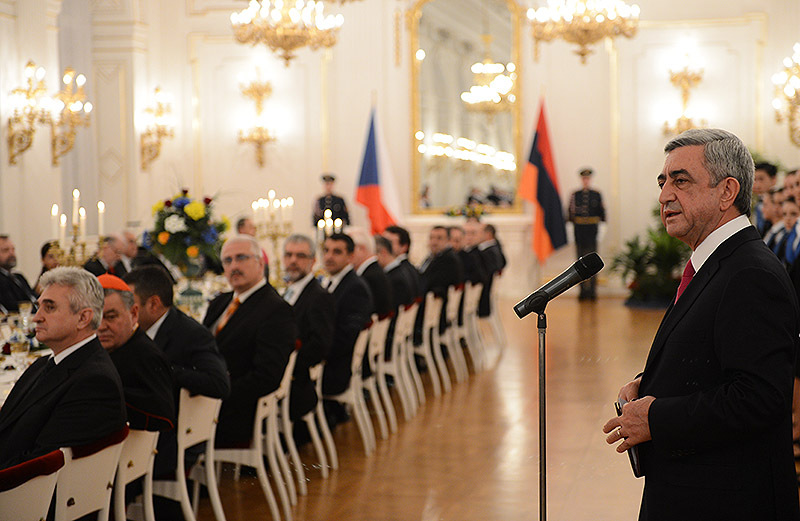 During the working dinner held in honor of the RA President, President Serzh Sargsyan and Milan Stech toasted speaking about the Armenian-Czech interstate relations, great role of parliamentary level cooperation development in those relations, Czech and Armenian people friendship, decentralized cooperation in various areas: scientific, cultural, trade, also the two countries’ cooperation in international structures and other parliamentary assemblies and a number of issues of mutual interest. 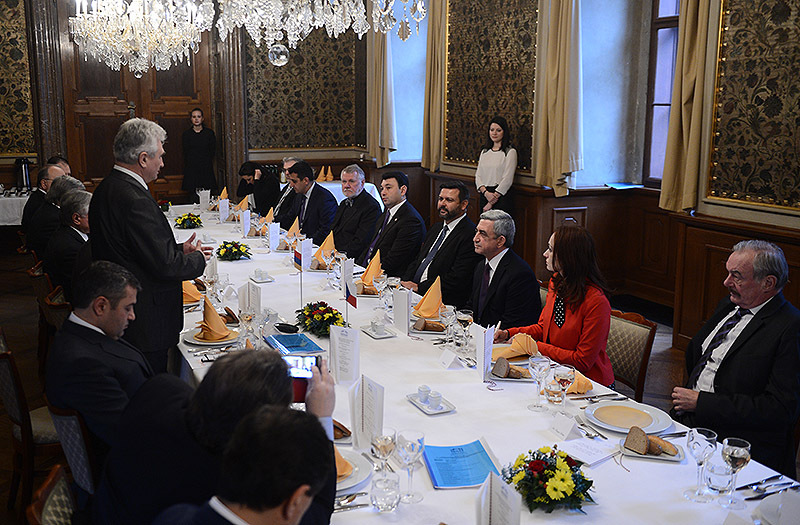 At the beginning of the meeting, President of the Senate Milan Stech noted that the Czech Republic wishes to strengthen and deepen bilateral ties of the two countries underlining that Armenian-Czech interstate relations are amicable. President of the Senate spoke about Armenian-Czech people historical generalities, many difficulties and challenges overcome over the centuries; he underscored that Armenia still continues to live in a complicated region. On behalf of his country, President of the Senate gave confidence that Czech Republic wants all problems to be solved in peaceful and civilized way, as Czech Republic did it in its time. He noted that economic development of the country is the important pledge for peace and the Czech Republic is ready to expand and strengthen relations with Armenia in favor of Armenia and its people. In particular, he stressed the importance of cooperation development in traditional areas: food industry, energy, culture, science, etc and cooperation between the two Parliaments. 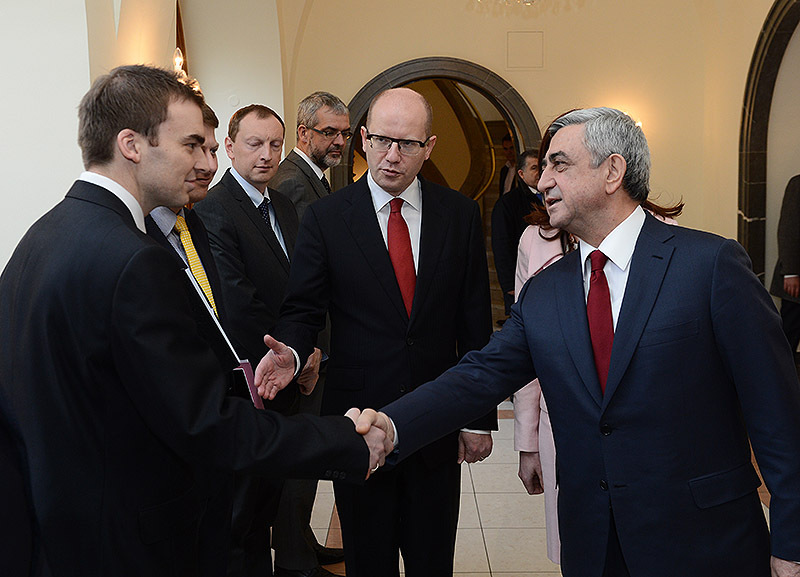 Expressing gratitude for warm reception, President Serzh Sargsyan expressed confidence that his first state visit in Armenian-Czech relationship history will foster bilateral relations. President of Armenia expressed with satisfaction, that relations between Armenia and Czech Republic during four-five years develop in all areas, which, in his convincement, stems from the two countries and people interest. The President noted with satisfaction about the opening of Embassies in two countries, stated that political dialogue was activated and high-level visits became more frequent in recent period. 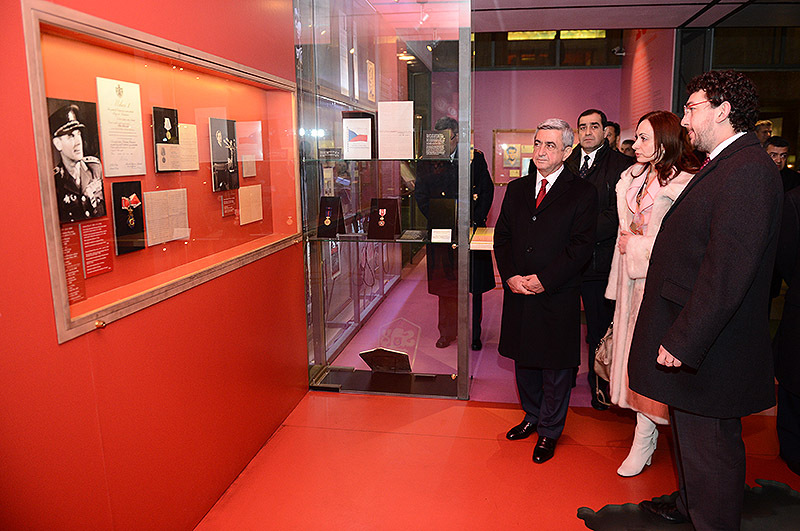 President Serzh Sargsyan spoke about Armenian-Czech cultural days held in Yerevan this year and in Prague in 2015 and considered it important step for cultural development between the two countries. 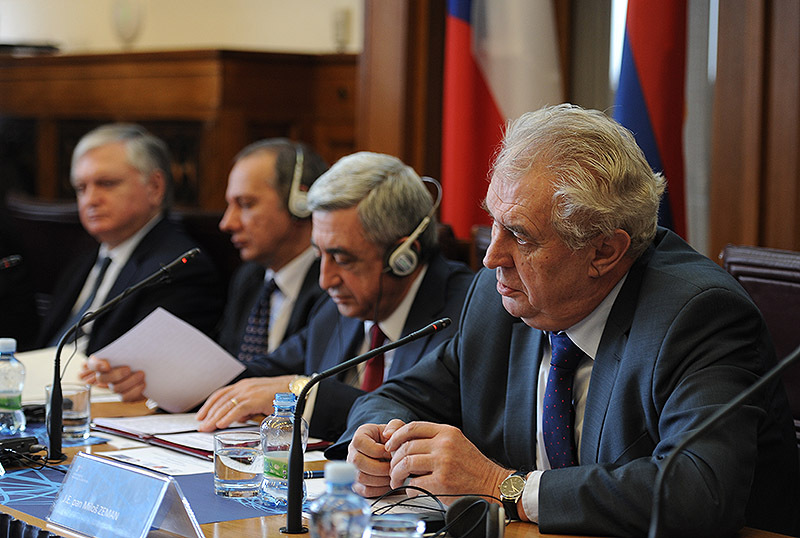 Speaking about insufficient indicators of Armenia and Czech Republics trade circulation volume, President Serzh Sargsyan stated with satisfaction that in spite of it, trade circulation volume in 2013 has increased by 40 percent compared with 2012. 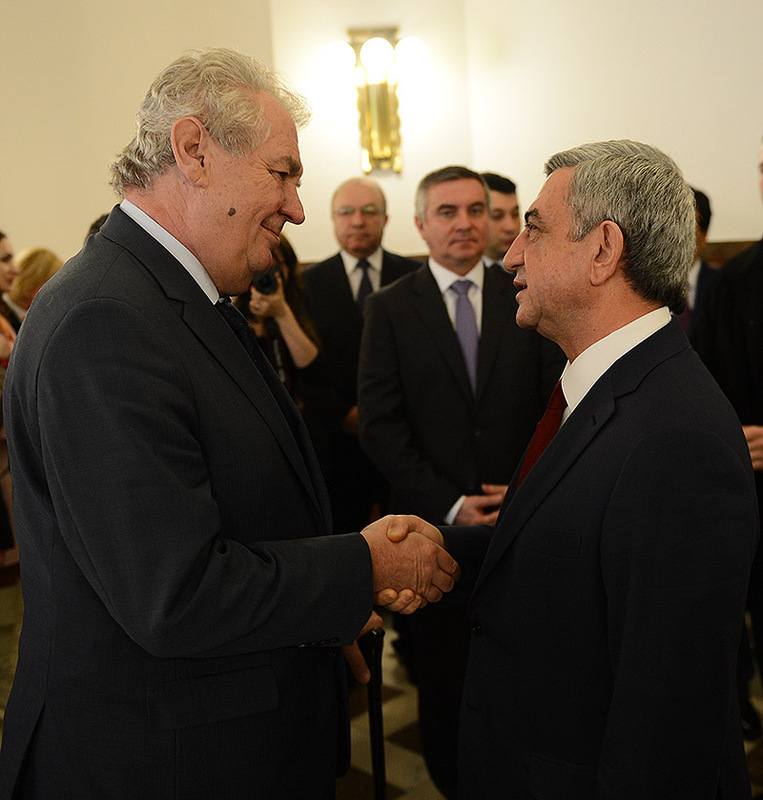 At the end of the meeting, President Serzh Sargsyan wished parliamentary cooperation of Armenia and Czech Republics continue to develop in the spirit of strengthened friendship and continuous progress in favor of the two countries and people’s empowerment. 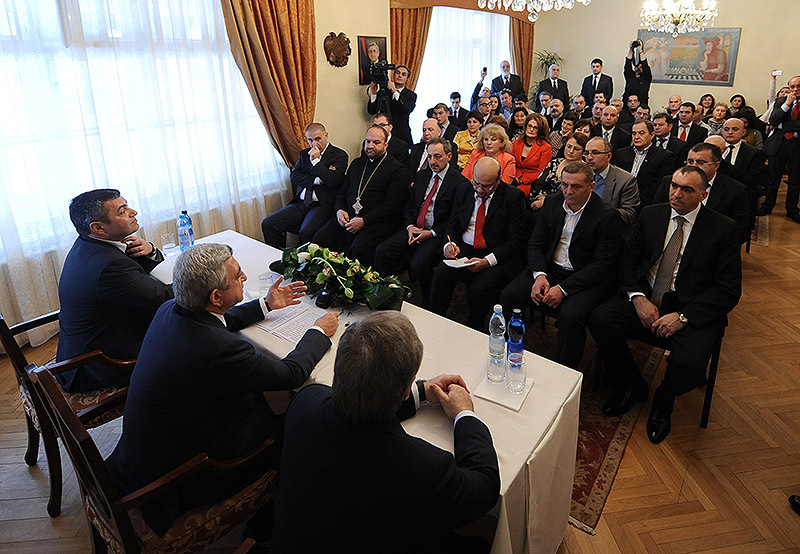 After the meeting held in Senate, President Serzh Sargsyan visited Prague Municipality where he held meeting with Prague Mayor Tomas Hudecek. 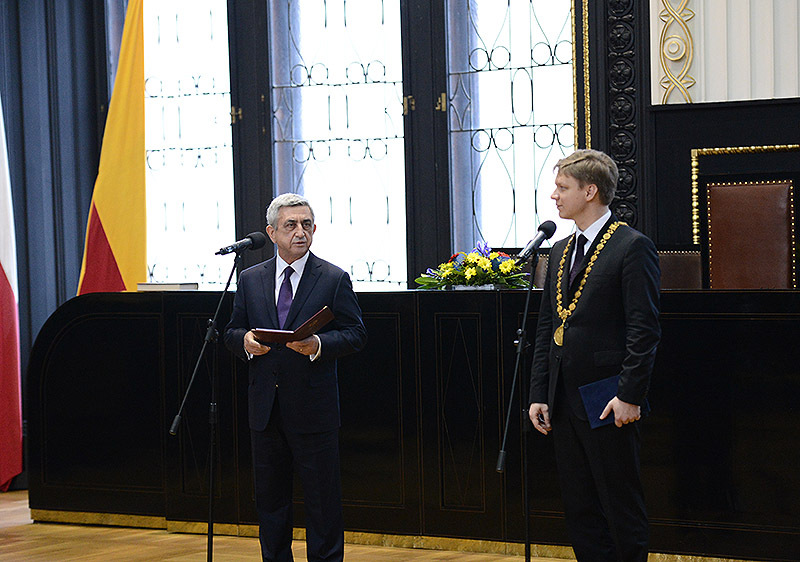 President of Armenia made a note in Honorable Visitors Book of Prague and got the key to the city from Prague Mayor as a sign of the two countries and people friendship. 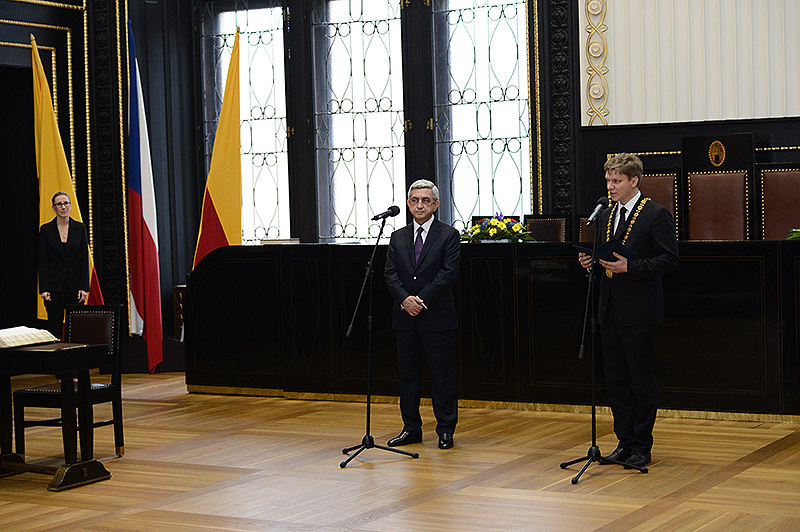 In his welcoming address, Prague Mayor noted in detail about Armenian-Czech people centuries-old friendship, historical and cultural connections, speaking about Armenian trace in Prague. Mayor Tomas Hudecek stressed the importance of decentralized cooperation development. 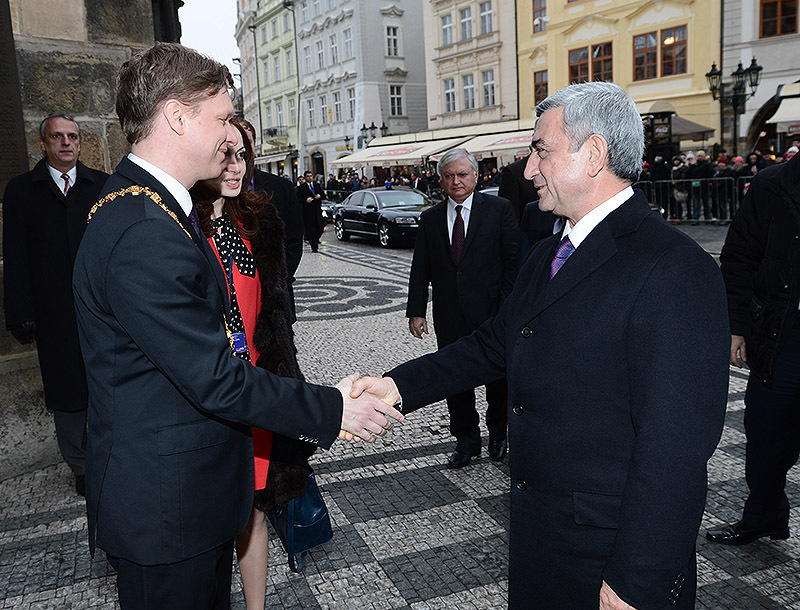 In response to Prague Mayor Address, President Serzh Sargsyan noted that it is great pleasure for him to visit Prague Municipality in the framework of his state visit to the Czech Republic. He expressed with satisfaction that his first visit in presidential level, full of official meetings and working discussions develops with Armenian-Czech traditional spirit of friendship. 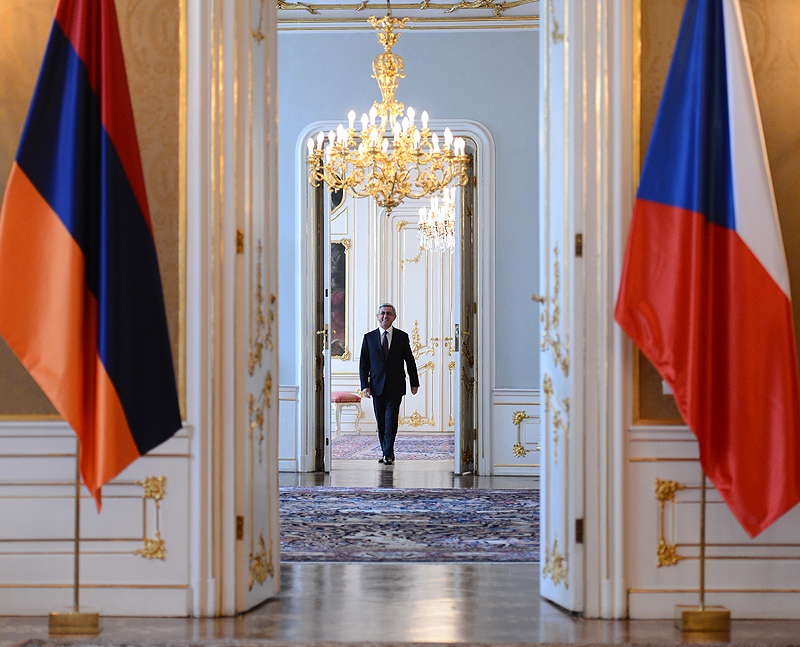 “I am absolutely confident that the effective meetings with the Czech Leadership during my state visit will serve to the aims to achieve high level of Armenian-Czech progressive relations in recent years and to develop mutually beneficial and multi-sectoral cooperation. Indeed, I am pleased to be deserved with such an honor in one of the ancient capitals of Europe, beautiful Prague City Hall. In addition to being a capital of a friend country, Prague is considered to be one of the most important political, economic and cultural centers. I once again will mention an interesting fact about Armenian trace on Prague: in the XVII century, the owner of one of the cafes of Prague was Armenian named Gevorg from Damascus. Meanwhile, early in the 20th century, first carpet factory belonged to an ethnic Armenian Artin Aslanyan who lived in Prague. Yerevan and Prague have great potentiality of cooperation and I hope that legal bases will be created to develop and deepen ties between our capitals. Allow me once again to express gratitude for your warm hospitality. 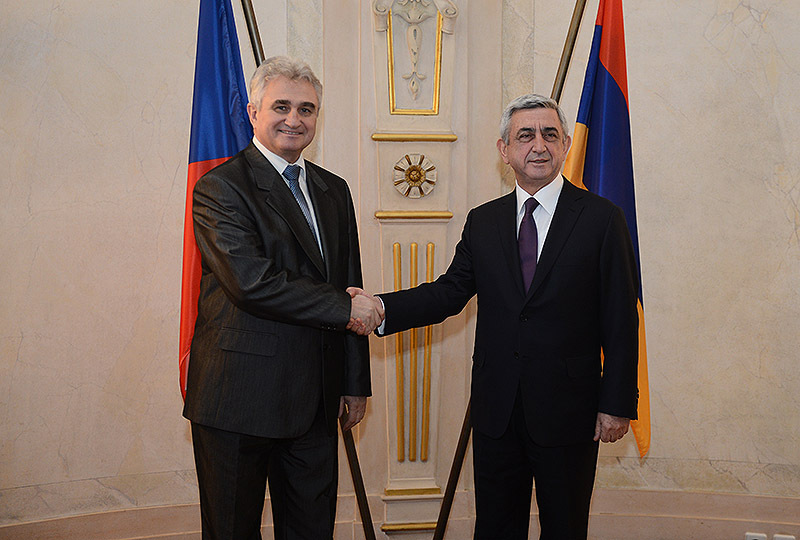 I look forward to meet You in the capital of Armenia, Yerevan” said President Serzh Sargsyan at a meeting with Prague Mayor. In the framework of his state visit, tonight, President of Armenia held meeting with the Spiritual Leader of Czech Republic and Prague Cardinal-Archbishop Dominik Duka. At the beginning of the meeting, President of Armenia underlined that being a president of a country first adopted Christianity as a state religion, tries not to miss the opportunity to meet the local spiritual leaders during foreign visits. The President noted that there is a community of Catholics in Armenia and the number of Armenian Catholics spread around the world is not few. 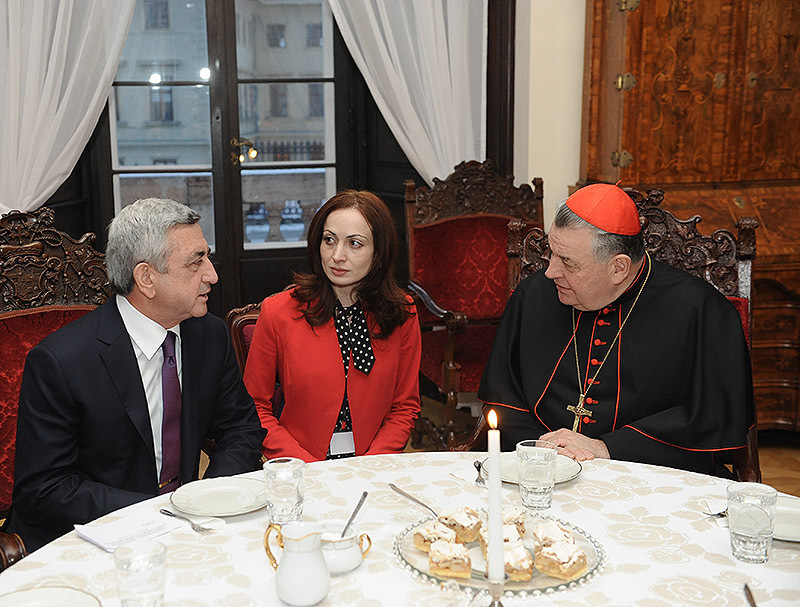 President Serzh Sargsyan is convinced that, perhaps, it is the reason of friendly ties establishment between Armenia and the Holy See. 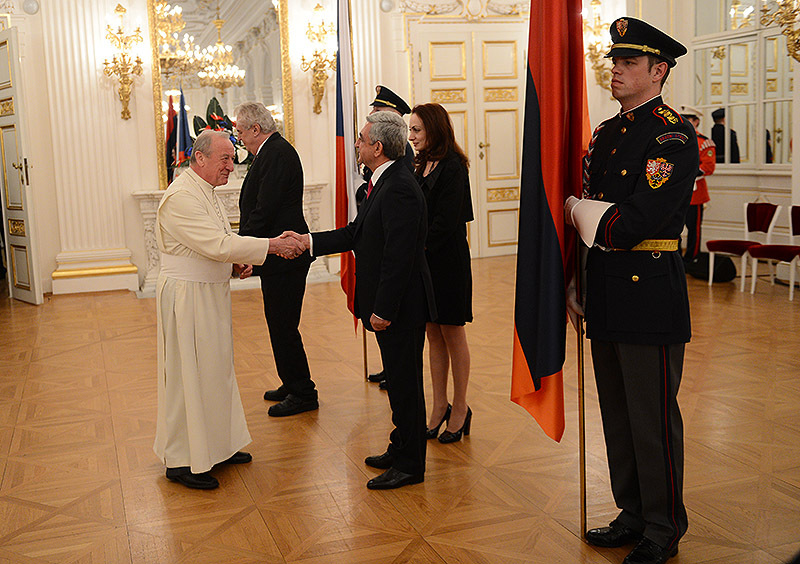 During the meeting, President of Armenia spoke about rich common heritage considering sufficient to mention only about Mechitarists in Vienna and Saint Lazarus Island in Venice from many examples. 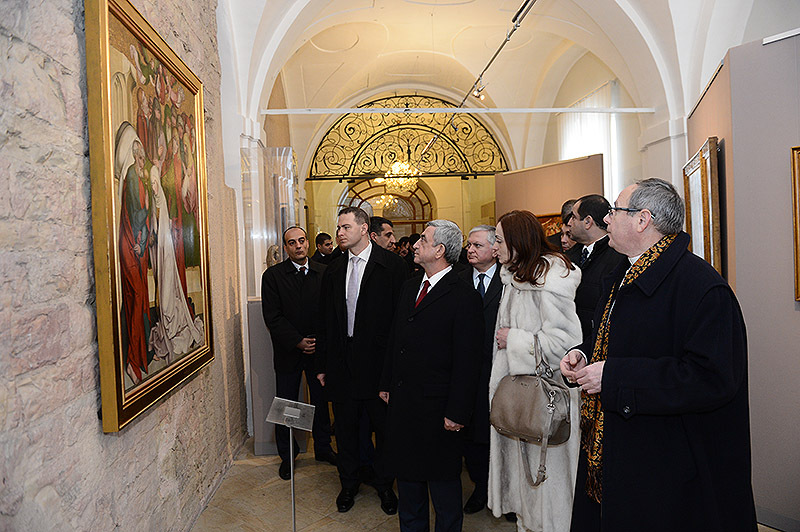 The interlocutors stressed the importance of opportunities to strengthen and foster relations on the basis of the common heritage noting with satisfaction that cooperation has started between Armenian Apostolic Church, Czech Priesthood and Catholic Church. 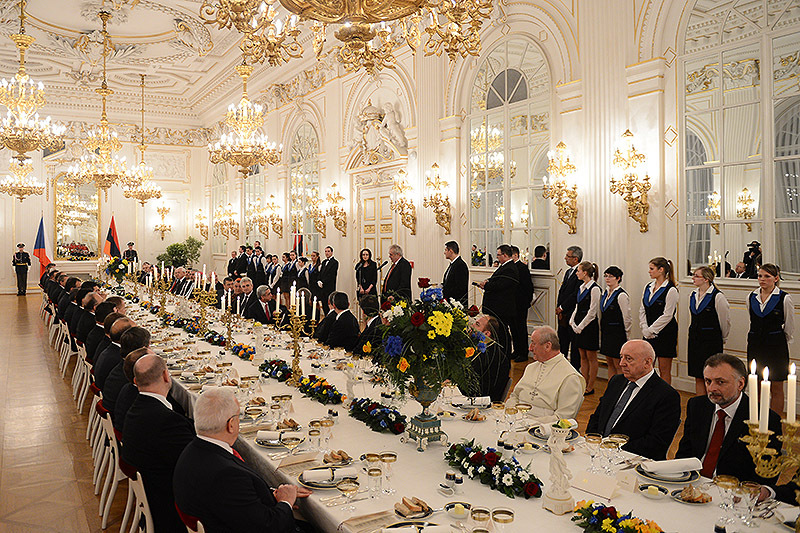 In the evening of January 30, on behalf of the President Miloš Zeman a state dinner was held in honor of the President Serzh Sargsyan who is in the Czech Republic on a state visit. 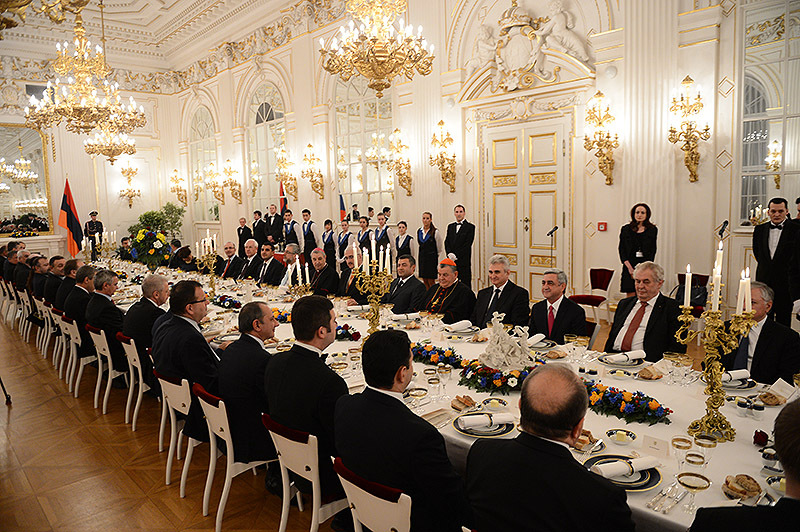 According to established protocol, the Presidents of the two countries made toasts mentioning the results of the RA President state visit to the Czech Republic, perspectives of interstate relations development, questions of Armenian-Czech mutual agenda involved in various areas, the two nations historical connections, also Armenian community of the Czech Republic being a natural bridge in Armenian-Czech relationship and a number of other questions. The Parties underlined that Armenian-Czech people friendship is a stable foundation to develop and strengthen interstate relations. 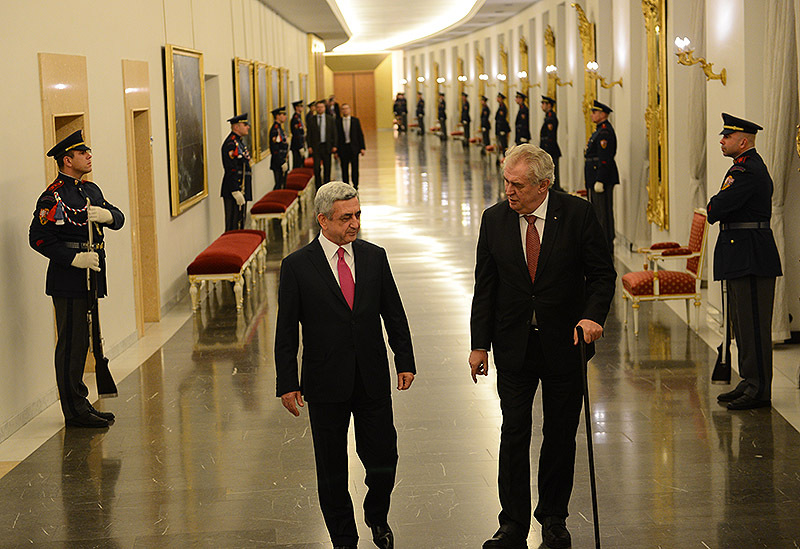 Presidents Serzh Sargsyan and Miloš Zeman stressed the importance of further active bilateral work to realize the acquired agreements and signed documents during the RA President state visit. 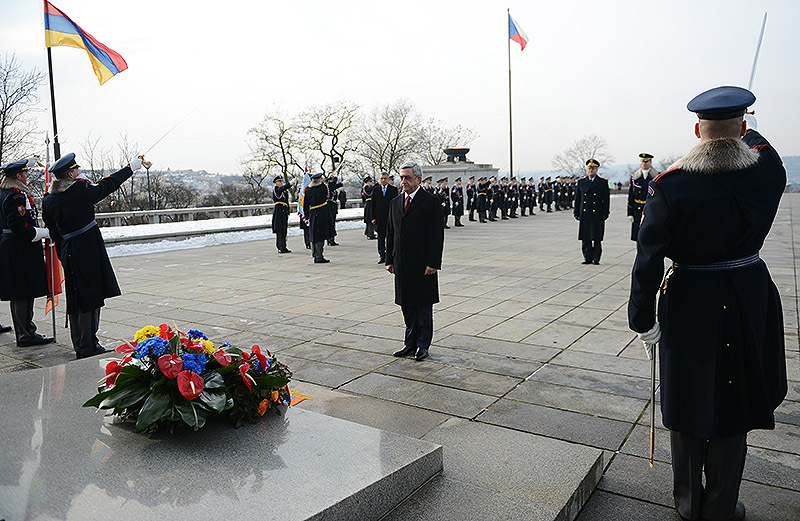 In his welcoming address, President Serzh Sargsyan underlined that Armenian people remember with gratitude the names of such honored people of Czech nation, as Tomáš Masaryk, the President of Czechoslovakia after World War I, his contemporary, Czech writer and humanist Karel Hansa, who, in the first half of the 20th century, spread light on Armenian Genocide through their humanitarian, political and social activities. 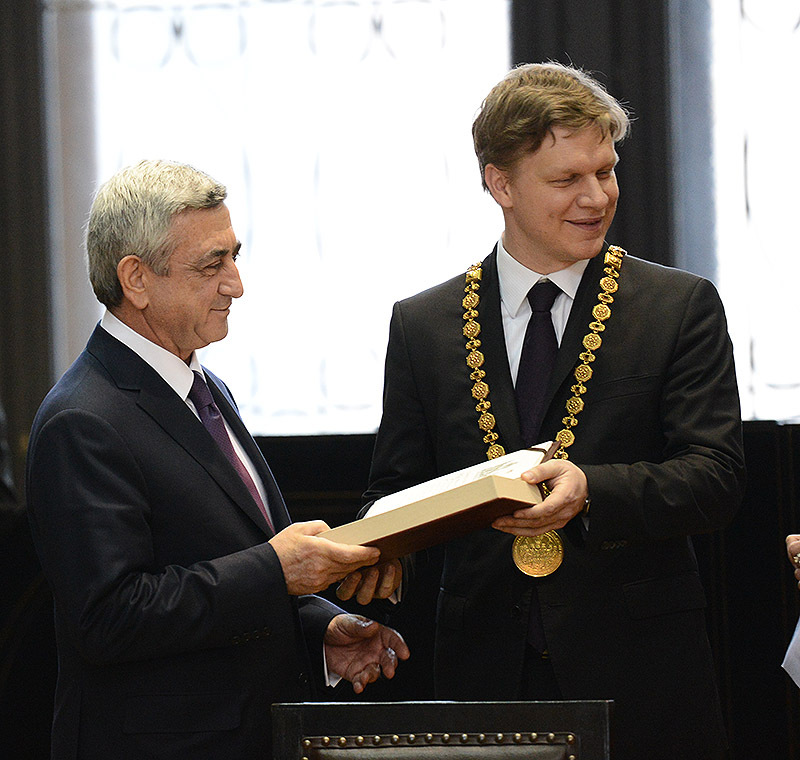 In his address, President Serzh Sargsyan mentioned the honored people of Czech nation who were devoted to Armenological studies, Bedřich Hrozný, orientalist and linguist, Václav Černý , Ludmila Motalová, armenologist-translators due to whom Armenian eminent poets Isahakyan, Sevak, Saryan and others’ poems were translated into Czech language. 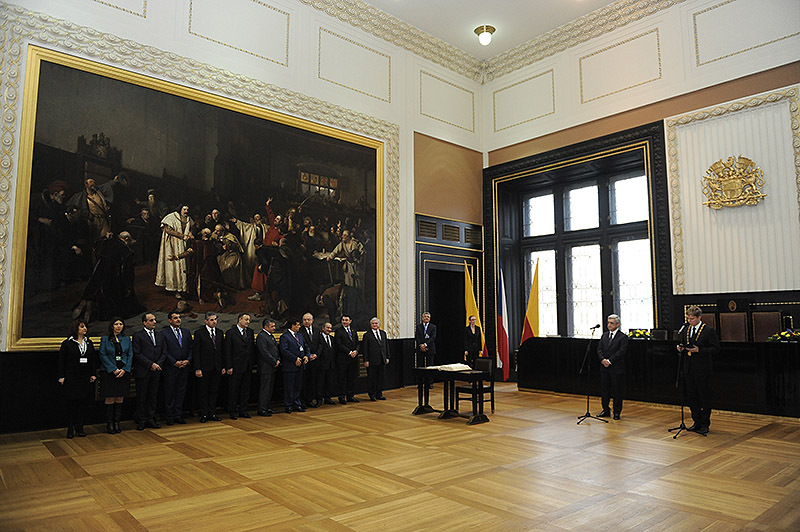 In confirmation of the two people’s friendship, the President of Armenia mentioned another memorable fact: during Chairmanship of Tomáš Masaryk and due to his personal decision, about 60 Armenian born students were given opportunities to study in the prestigious universities of the country with Czech scholarships communicating with and adopting European culture and advanced social and political views. 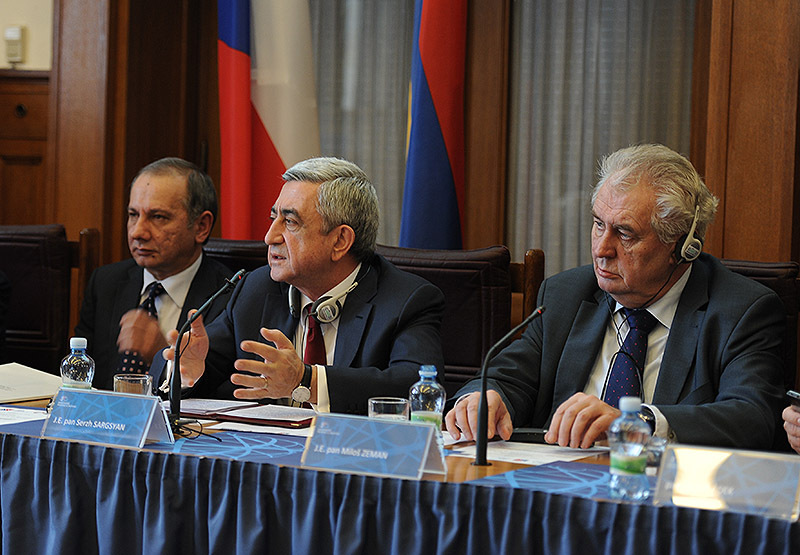 President Serzh Sargsyan underscored that today, Armenian fellow citizens still continue to study in the Czech Republic educating and communicating with European culture. 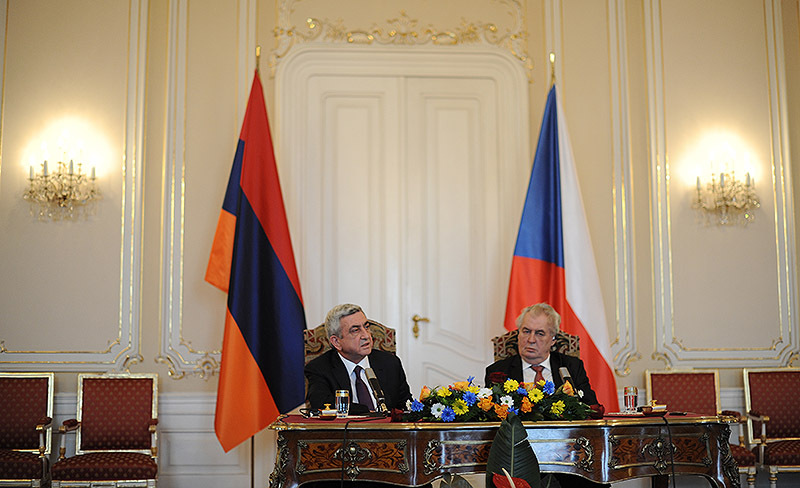 In conclusion, President Serzh Sargsyan once again expressed gratitude to the President of Czech Republic for the invitation, warm hospitality and effective discussions in the atmosphere of mutual confidence and wished eternity and prosperity to the Czech Republic, Czech people and Armenian-Czech friendship. 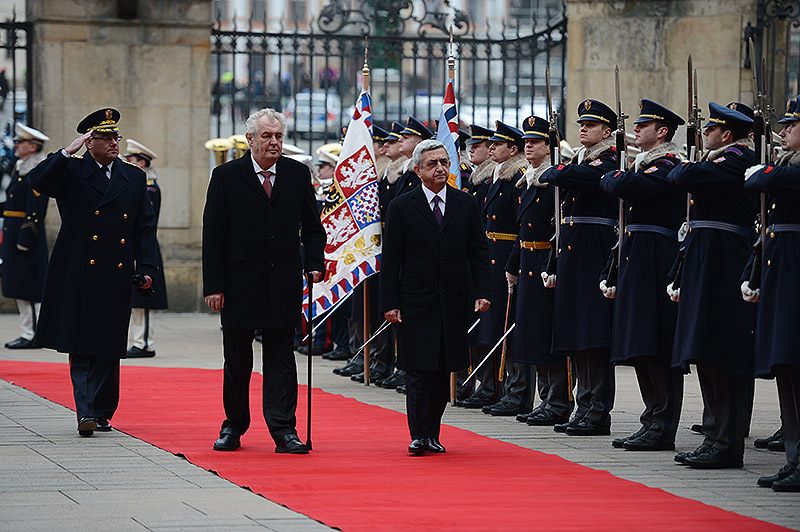 President Serzh Sargsyan continues to pay a state visit to the Czech Republic. On January 31, in the morning, the President of Armenia held a meeting with Chairman of the Chamber of Deputies of Czech Republic, Jan Hamáček. 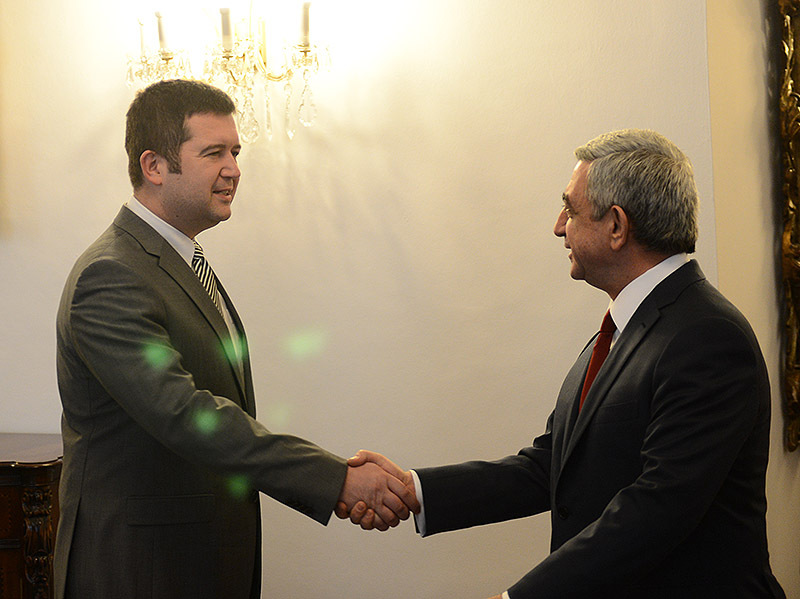 At first, President Serzh Sargsyan congratulated Jan Hamáček on the occasion of being elected as a Chairman of the Chamber of Deputies. During the meeting, the interlocutors stressed the importance of parliamentary diplomacy role in Armenian-Czech cooperation development and ties strengthening. They expressed willingness to develop cooperation and relations on the basis of mutual confidence and benefit. 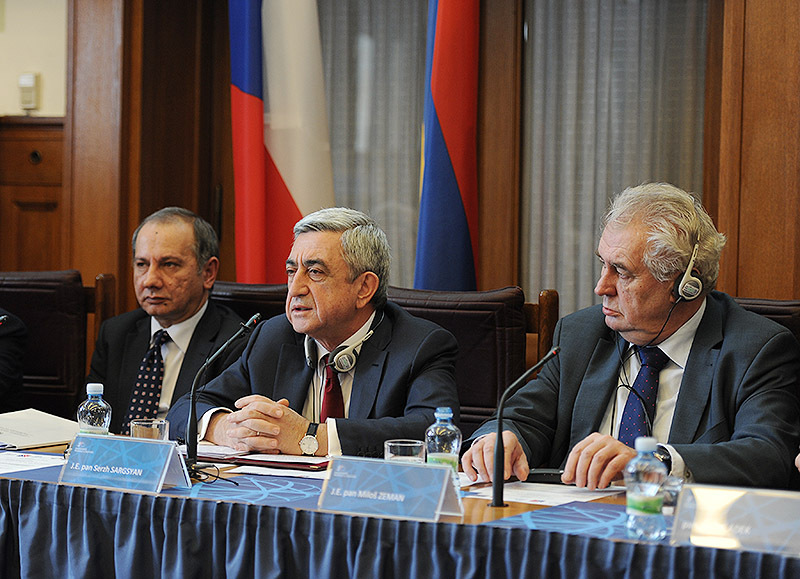 President Serzh Sargsyan underlined that inter parliamentary relations of the two countries increased significantly in recent years, exchange visits of parliamentarians were activated which, according to the President, creates good prerequisites to deepen mutual understanding of actual issues referred to the Armenia and Czech Republics mutual benefit, also to develop cooperation in international parliamentary formats. 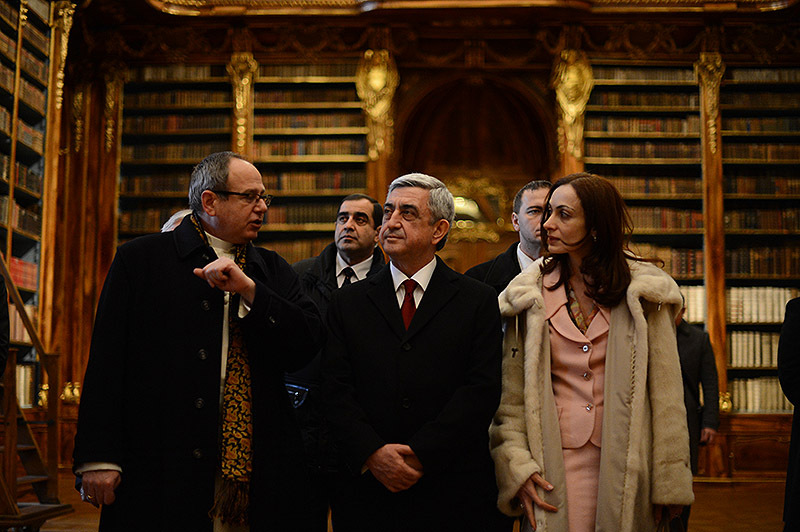 President Serzh Sargsyan underlined that he will be pleased to host the Leadership of Czech Parliament in Armenia noting that President of the National Assembly paid a visit to the Czech Republic in 2012. 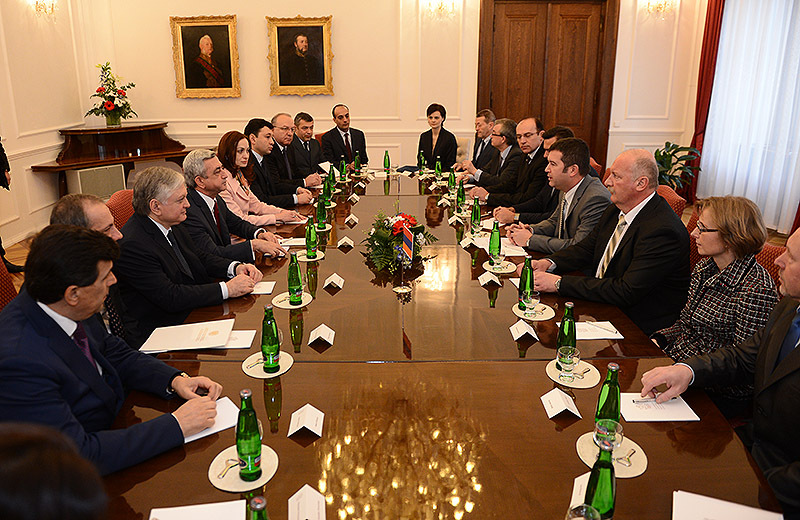 The President of Armenia and Chairman of the Chamber of Deputies of Czech Republic agreed that friendly exchange visits should be encouraged as inter parliamentary cooperation is the platform where each other’s concerns and questions should be heard this way promoting the two countries and people’s friendship strengthening. 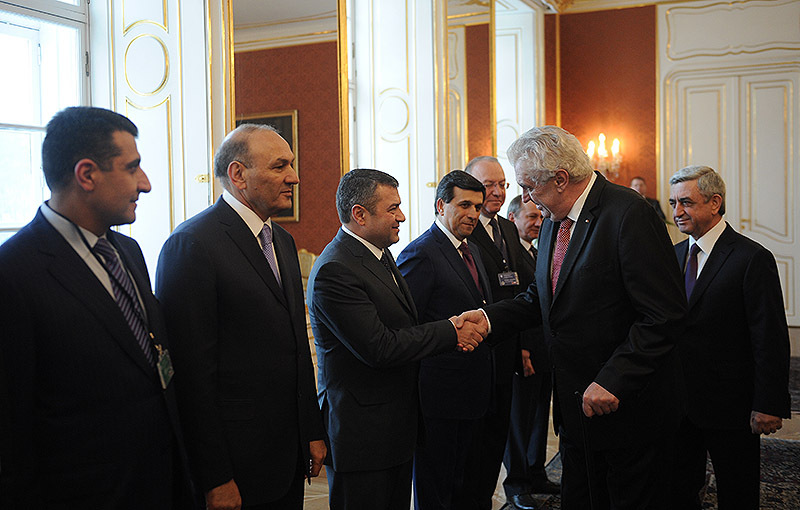 In this context, Jan Hamáček noted with satisfaction that after the last parliamentary elections, a large number of Armenian-Czech friendship group was formed in short period of time which, in his convincement, is a good basis for mutual efficient work. During the meeting, the interlocutors spoke about regional problems, NKR conflict settlement process, Armenia-Turkey relations and other questions of mutual interest. 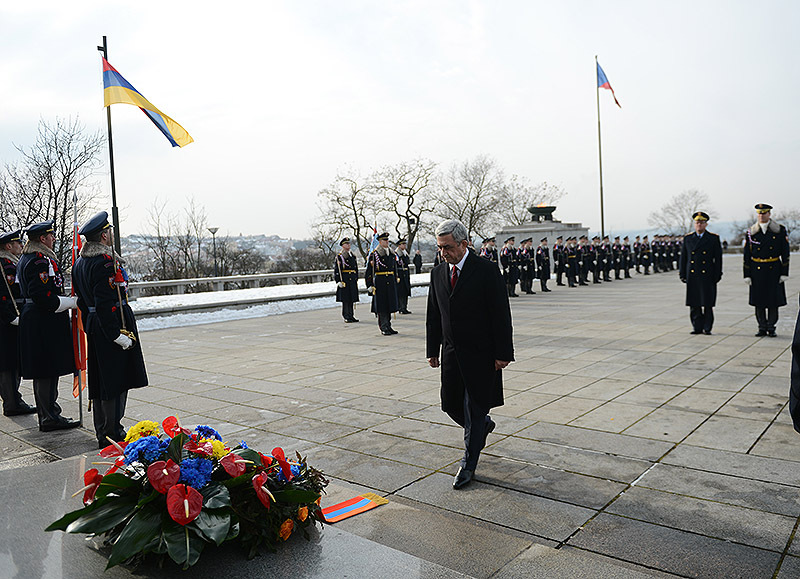 Today, President Serzh Sargsyan visited one of the most significant structures of 20th century for Czechoslovakia and Czech statehood, The National Monument in Vítkov. 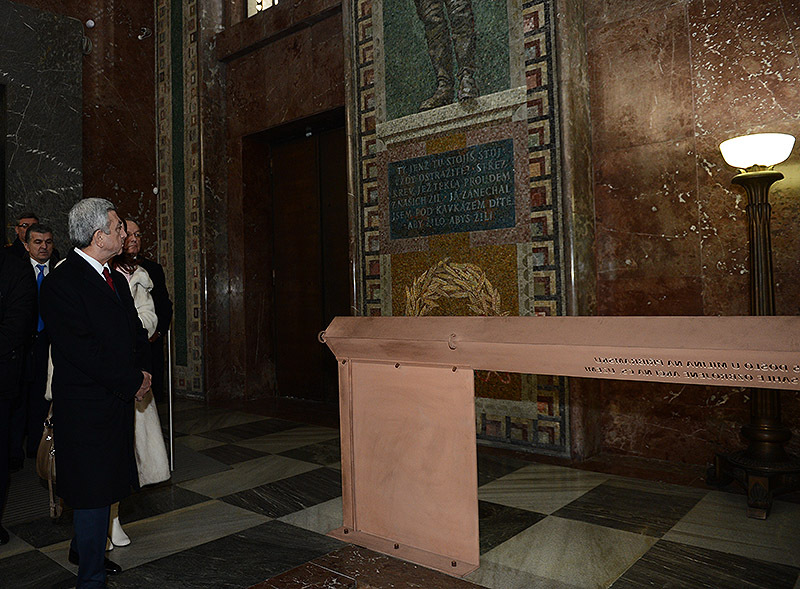 The President of Armenia paid tribute to the Tomb of the Unknown Soldier. 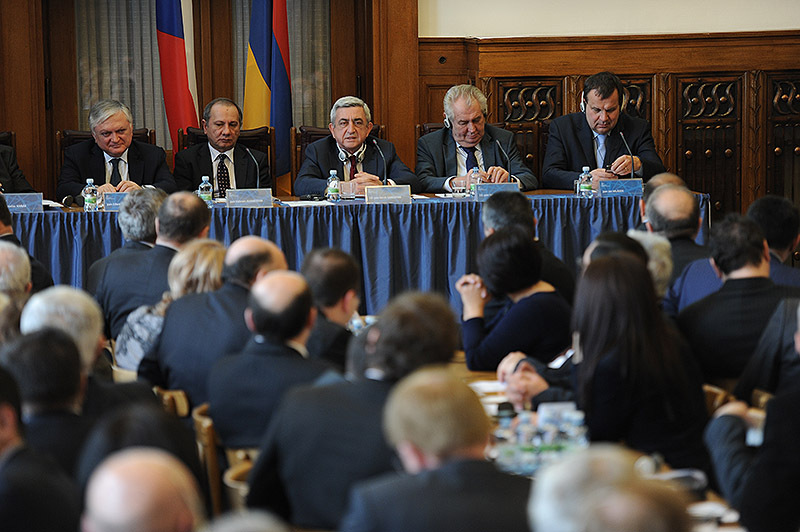 On January 31 President Serzh Sargsyan and President of the Czech Republic Miloš Zeman attended Armenian-Czech business forum held in the Ministry of Industry and Trade. The Presidents greeted business forum of such format and the documents signed in the framework of it. 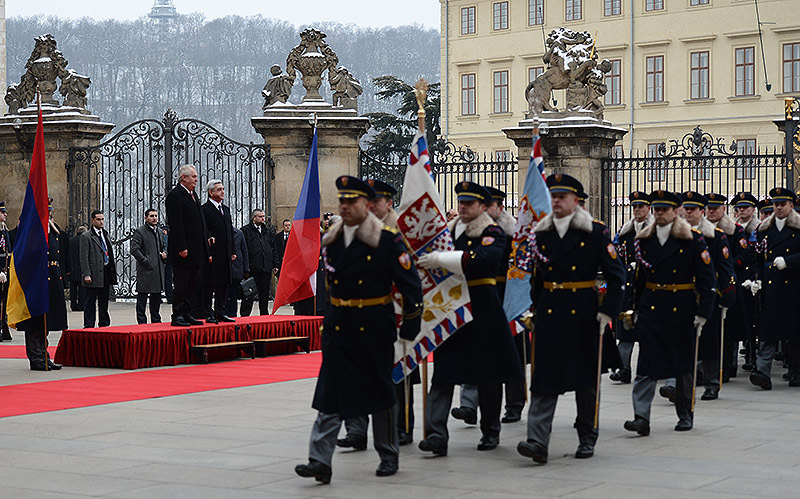 In particular, President Miloš Zeman stressed the importance of the agreements signed between Armenia and Czech separate regions which create good basis for developing decentralized cooperation. 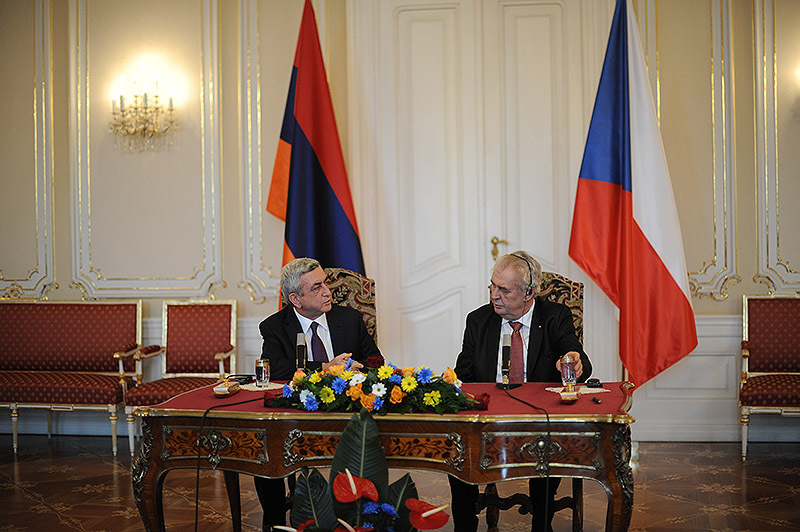 Presidents Serzh Sargsyan and Miloš Zeman agreed that Armenian-Czech economic relations have great potentiality and a great role is preserved for businessmen for complete use of it, they expressed confidence that the parties will officially encourage the ties expansion and cooperation development between businessmen. 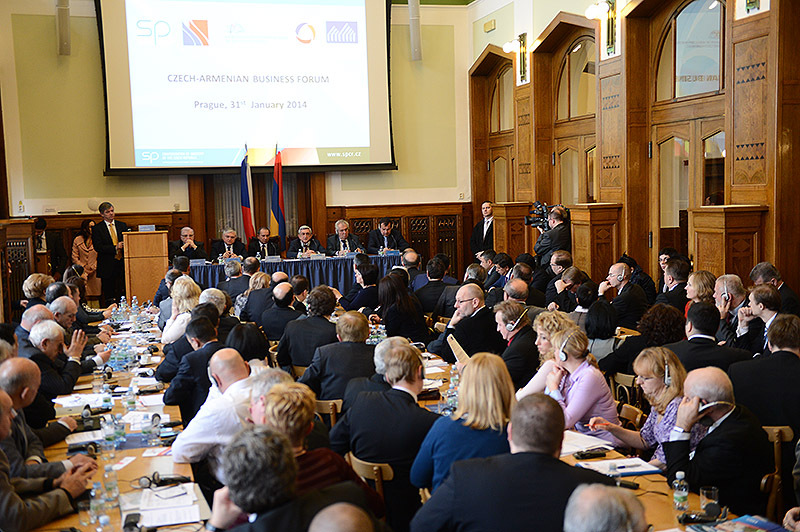 During business forum, Presidents of Armenia and Czech Republics spoke in detail about the areas of cooperation which have a perspective of development among them noting energy, information technologies area, food industry, jewelry making, etc. 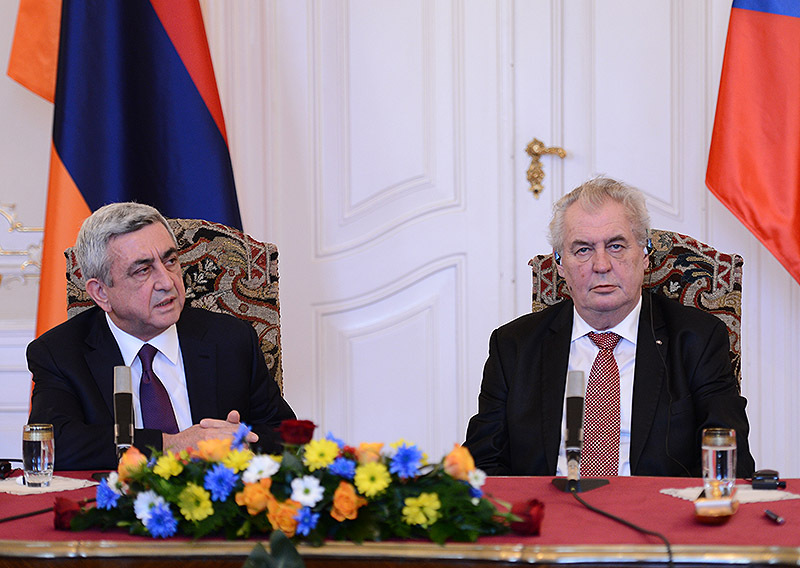 President Miloš Zeman noted that he accepted President Serzh Sargsyan invitation to visit Armenia with gratitude and expressed confidence that during the visit a signified delegation of Czech businessmen will accompany him and the next meeting of the two countries’ businessmen will take place in Yerevan. 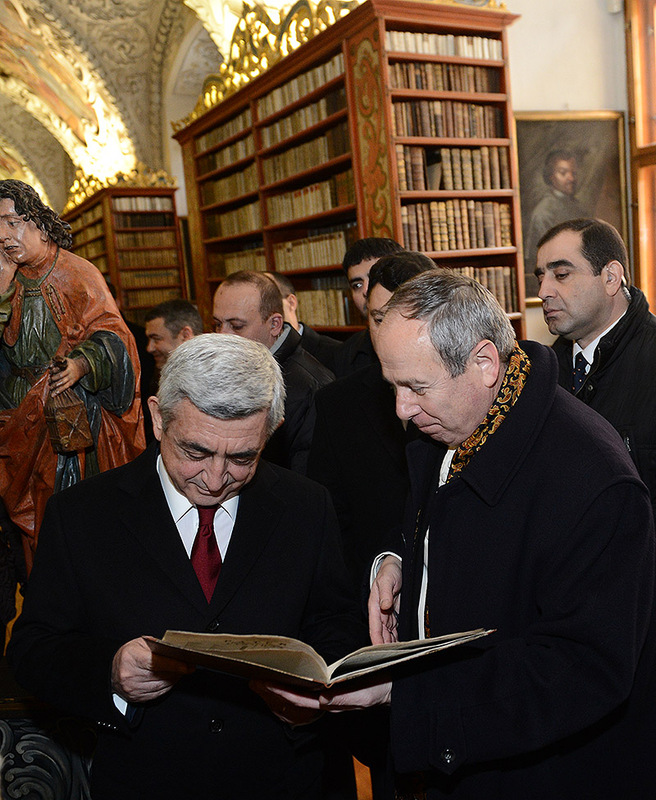 Today, President Serzh Sargsyan visited one of the most ancient abbeys in the capital of the Czech Republic, Strahov Monastery. 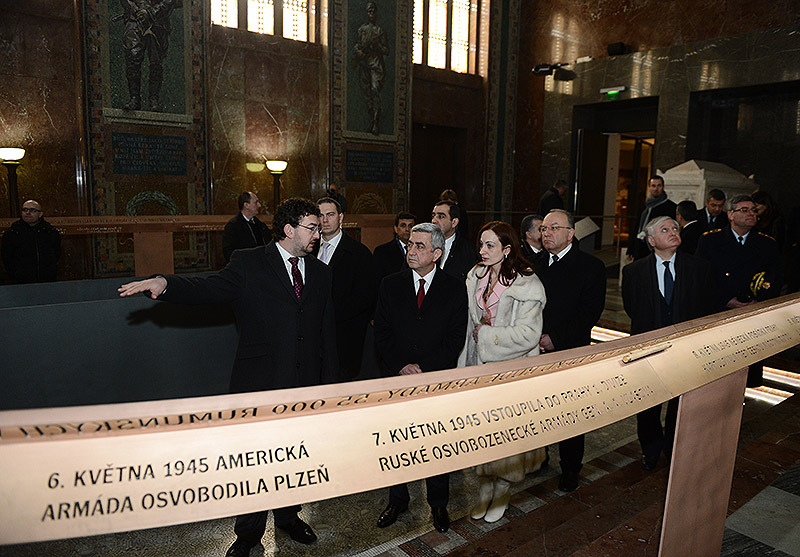 The President was introduced with the founding history of the complex, The Philosophical Hall located in the territory of the monastery, Strahov picture gallery and the vast library which exists over 800 years where more than 2,500 manuscripts and 130,000 books are stored. 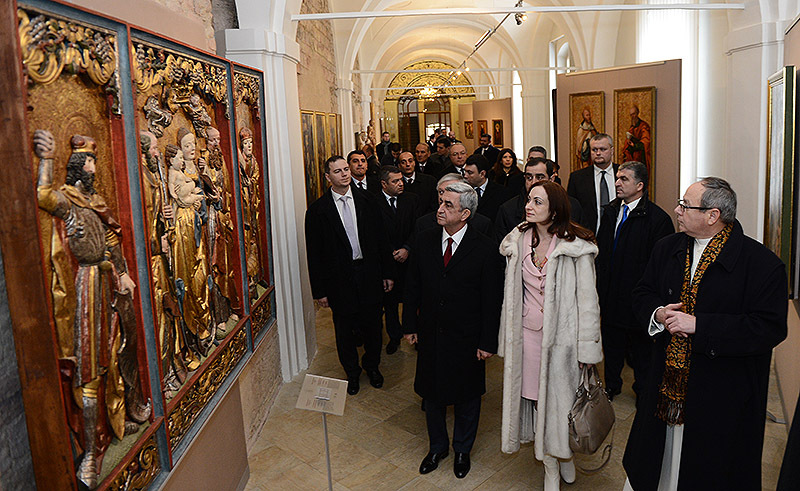 The President of Armenia was also in Virgin Mary Ascension Cathedral founded in 1140-1143. 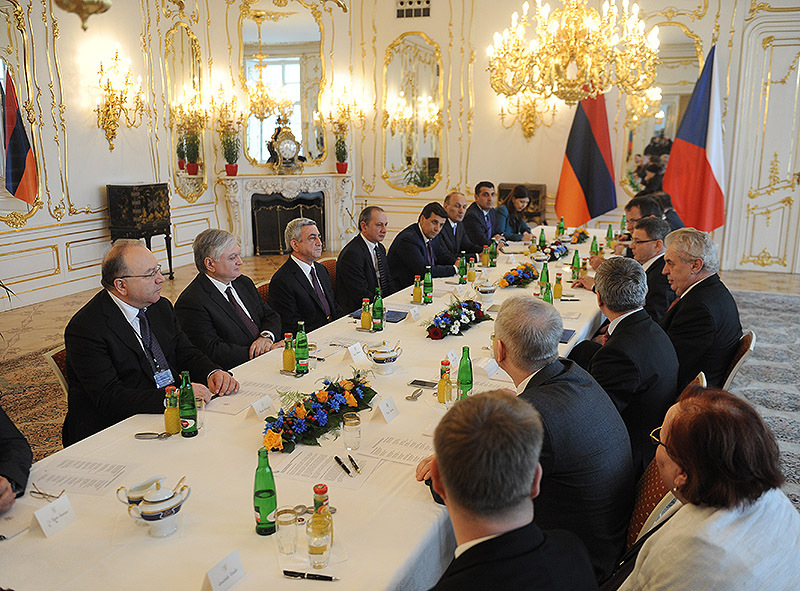 On the last day of his state visit in the Czech Republic, President Serzh Sargsyan held a meeting with Prime Minister of the country Bohuslav Sobotka. At the beginning of the meeting, President Serzh Sargsyan congratulated at first Mr. Sobotka on the occasion of assuming office and forming new government and wished him success. 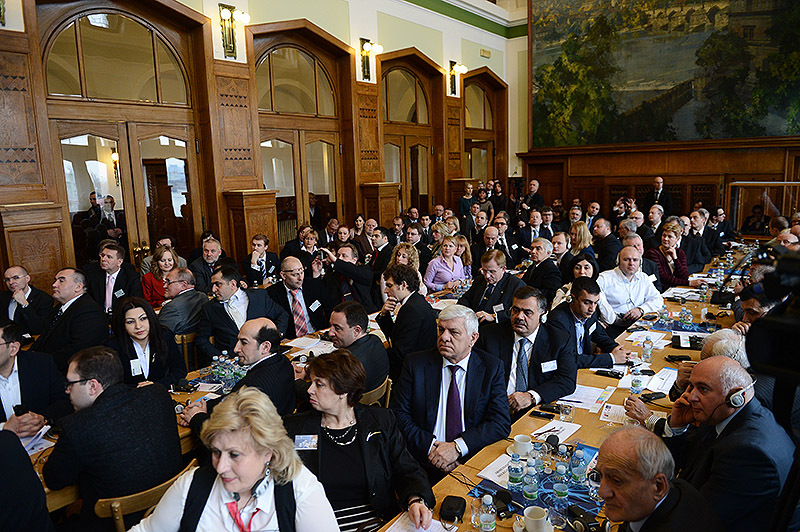 The Parties spoke in detail about the opportunities to develop Armenian-Czech economic cooperation, perspective areas, business and investment advantages and problems of the two countries. The RA President and Prime Minster of the Czech Republic stressed the importance of contacts between business communities to strengthen trade relations. 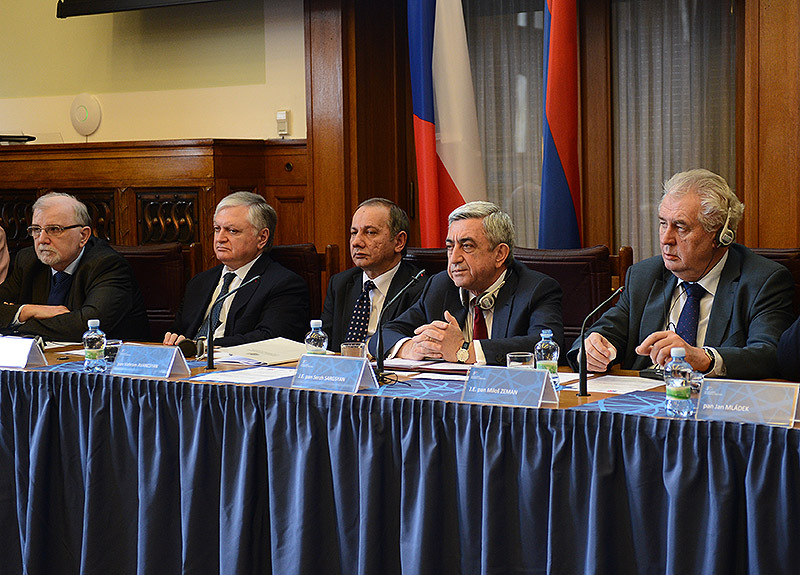 In that context, the Parties noted with satisfaction about Armenian-Czech business forum held today, the signed agreements systematizing economic area during the RA President state visit which in their convincement, are basis to develop economic mutual cooperation in many areas. 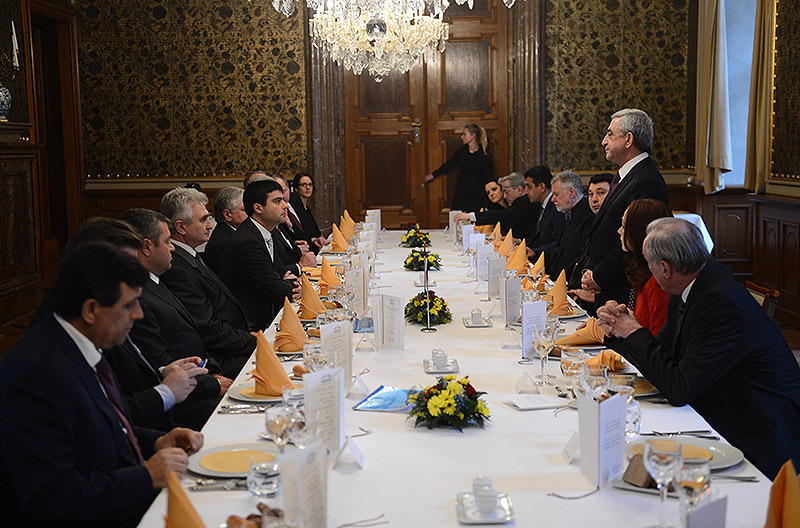 President Serzh Sargsyan held a meeting with representatives of Armenian community in the Czech Republic. 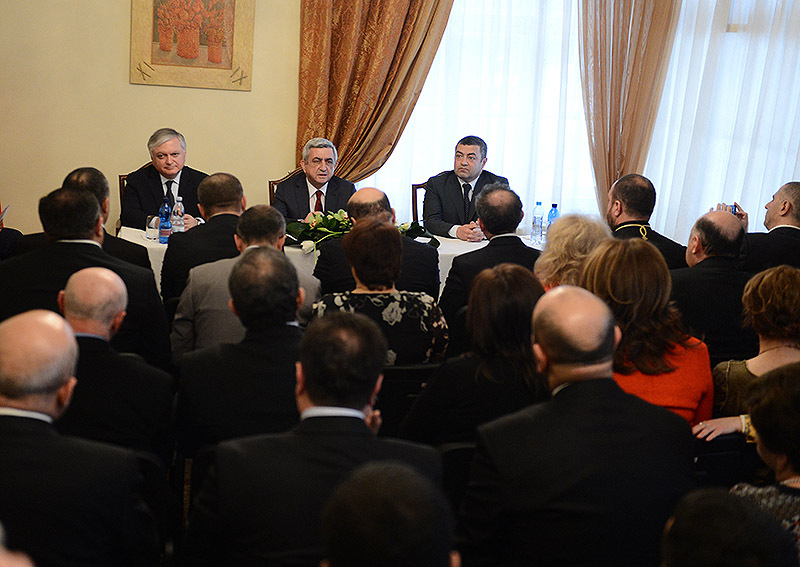 In the open and unconstrained atmosphere, the President of Armenia responded to the questions raised by the participants of the meeting.